Though a new, hopping spacecraft wasdesigned with a Mars mission in mind, its creators plan to send it on a testvoyage to the moon first ? and possibly snag a big prize in the process. Exploring the surface of the moon or Marsisn?t anything new; unmanned, wheeled rovers have been doing it for decades.But these vehicles have limits ? they can?t crawl inside craters, scale cliffsor travel long distances. NASA?s Spirit and Opportunity rovers, for example,have logged just around 20 miles since landing on Mars in 2004. These roversaren?t exactly speed demons; Opportunity maxes out at 0.1 mph. Enter the Draper/MIT hopper. 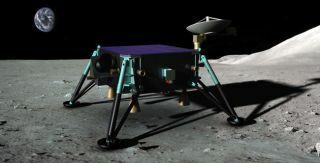 Draper andMIT are both members of the Next Giant Leap consortium that is working tosecure fundingfor a moon mission. ?Draper has a long history of helpingNASA land things on other planets," said Seamus Touhy, Draper?s directorof space systems. ?They all ended up being things that landed and stayed. Ifyou wanted to explore, you landed a rover.? But mostrovers can only examine their immediate neighborhood ? and that takes time.If you want to explore faster and on a more expansive scale, a spacecraft mustbe able to land, take off again and land somewhere else, he said. The MIT/Draper solution is a new type ofrobotic explorer that can hop over obstacles, rather than inch along aplanetary surface.? Hopping, they believe, will make it easier for an explorerto navigate rugged terrain, travel greater distances and gather more data. TheMIT/Draper hopper can travel three to six ?miles (5 to 10 km) per hop and covera total of 25 miles (40 km) in a few hours. The prototype hopper, which would belaunched atop a rocket from Earth, is about the size of a good-sized coffeetable, about 3 feet by 4 feet, Touhy said, and has an all-composite frame.Because it is designed to operate in low-gravity environments, it gets around usinga cold-gas propulsion system that pulses jets of gas through thrustersunderneath the vehicle. "All you hear is the pop-pop-pop ofgas," Touhy told SPACE.com. For testing on Earth, the smallerprototype of a hopper that would be used in space has four electric,downward-pointing ductedfan engines that provide lift to counter the vehicle?s weight and simulatea low-gravity environment. But the hopper is not like a pogo stick,Touhy said. It ascends and lands more smoothly, like a helicopter. All the prototype systems, including thecold-gas system, have been tested, though just with up and down movement so far. ?Free-flight tests of the entire system with unconstrained motion are scheduledto begin early next year. Draper is the lead systems engineer anddeveloper of the guidance, navigation, control and avionics systems; MIT isbuilding the test bed structure and propulsion system.
? "We?re hoping by 2014 we?ll have amission," Touhy said. Beyond roaming the surface of the moon, thespacecraft could help open up other frontiers in space, such as the Red Planetor a nearby asteroid, the scientists say. "It could be used on asteroidswhere you couldn?t use a rover because it?s such a reduced gravity environment,"Touhy said. "We?re at a similar point where we were pre-Apollo. You alwayslearn a lot more by touching down." This story was provided by BusinessNewsDaily, a sister siteof SPACE.com. ReachBusinessNewsDaily senior writer Ned Smith at nsmith@techmedianetwork.com. Follow him on twitter @nedbsmith.